Put simply, Canada’s Aboriginal peoples were here when Europeans came, and were never conquered. As for Amerindians, they tortured to death several missionaries. The best-known is Jean de Brébeuf. Mohawks, allies of the British, captured and tortured Europeans. One of their victims was Pierre-Esprit Radisson (1636 – 1710), who was saved by his Amerindian family and eventually escaped. He and his brother-in-law, Médard des Groseillers (1618 – 1696), discovered the sea to the north, the Hudson Bay. Fur traders could henceforth travel by boat to collect beaver pelts. In 1535, the year after he claimed Canada for France, Jacques Cartier failed to return to France before the onset of winter. Several members of his crew started to die of scurvy. Amerindians supplied Cartier with infusions of thuja occidentalis, white cedar, and saved his men. Jacques Cartier was at Stadacona, an Iroquoian (Mohawk) village near the current Quebec City. This was Cartier’s second trip to what would become New France in the first decade of the 17th century. He was returning his sons, Domayaga and Taignoagny, to Chief Donnacona. The French also owe Amerindians their birch-bark canoes. These were light and could be built in very little time with material nature provided. How would Canadiens have become voyageurs and guides to explorers without the birch-bark canoes? The voyageurs learned Amerindian languages—there were and are several—and Amerindians prepared their food, pemmican. 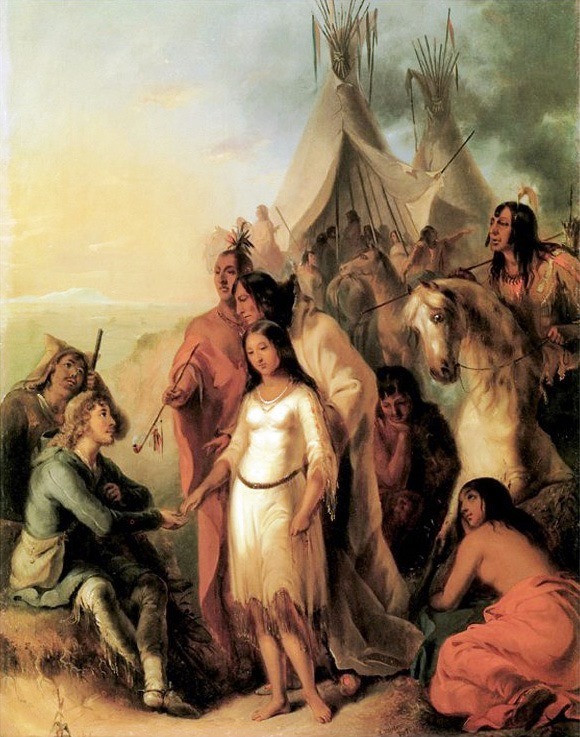 More importantly, given that France had sent very few women to New France until 1663, when the King’s Daughters, les filles du roy, started arriving, a significant number of French settlers married Amerindian women. So did Voyageurs. Some signed a three-year contract and stayed at the trading posts during the winter. They often married an Amerindian woman. They founded a people: the Métis, recognized aboriginals who speak Michif, a mixed language. Recognized aboriginals comprise the First Nations, the Inuit and the Métis. When New France became a British colony, Amerindians feared for their survival. Settlers wanted their land. England’s answer was the Proclamation of 1763. The Proclamation of 1763 protected the French and it also protected aboriginals. This story resembles that of the Quebec Act of 1774 which put England’s new French colony on an equal footing with British settlers by allowing them to keep their language, their faith, their seigneuries and their Code civil. Where aboriginals are concerned, the Proclamation of 1763 became their Magna Carta. It in fact turned 250 years old in 2013 and is enshrined in the Canada Act of 1982. If one is looking for the underpinnings of the Constitution of 1867 and Patriated Constitution of 1982, the Canada Act, the Proclamation of 1763 and the Quebec Act of 1774 are fundamental texts. Canada has a Department of Aboriginal Affairs and Northern Development and a Minister of Aboriginal Affairs and Northern Development. Jean Chrétien, a former Prime Minister of Canada, was Minister of Indian Affairs for six years. His [Jean Chrétien’s] one bold attempt to change how Ottawa traditionally dealt with native Canadians – the 1969 White Paper on “Indian Policy” – was so spectacularly repudiated by Indian leaders as a denial of their special status in Canada that it took him years to overcome their suspicions about his underlying motives. We are not ready for a conclusion. This story is a very long one and it has a few sad chapters. However, we have seen that the bonds that developed between Amerindians and the French were often dictated by need, but they were true bonds. For instance, the French needed not only canoes, but snowshoes and the appropriate clothes. They used what the Amerindians used. Moreover, after New France was ceded to Britain, both the inhabitants of New France and Amerindians were protected by Britain. The British may have had a motive: the Thirteen Colonies wanted their independence. There would be a war. Therefore, it was best not to alienate those who might help or to make sure they remained neutral. However, what seemed to be temporary became permanent. The rights given Amerindians became permanent rights. Such is also the case with the Quebec Act of 1774. There are separatists and extremists, but there has also been a long and mostly compatible partnership. How did the Seven Years War Affect Native Americans? 35 (1) The existing aboriginal and treaty rights of the aboriginal peoples of Canada are hereby recognized and affirmed. (2) In this Act, “aboriginal peoples of Canada” includes the Indian, Inuit, and Metis peoples of Canada. (b) the Prime Minister of Canada will invite representatives of the aboriginal peoples of Canada to participate in the discussions on that item. And whereas it is just and reasonable, and essential to our Interest, and the Security of our Colonies, that the several Nations or Tribes of Indians with whom We are connected, and who live under our Protection, should not be molested or disturbed in the Possession of such Parts of Our Dominions and Territories as, not having been ceded to or purchased by Us, are reserved to them, or any of them, as their Hunting Grounds — We do therefore, with the Advice of our Privy Council, declare it to be our Royal Will and Pleasure, that no Governor or Commander in Chief in any of our Colonies of Quebec, East Florida. or West Florida, do presume, upon any Pretence whatever, to grant Warrants of Survey, or pass any Patents for Lands beyond the Bounds of their respective Governments. as described in their Commissions: as also that no Governor or Commander in Chief in any of our other Colonies or Plantations in America do presume for the present, and until our further Pleasure be known, to grant Warrants of Survey, or pass Patents for any Lands beyond the Heads or Sources of any of the Rivers which fall into the Atlantic Ocean from the West and North West, or upon any Lands whatever, which, not having been ceded to or purchased by Us as aforesaid, are reserved to the said Indians, or any of them. And We do further declare it to be Our Royal Will and Pleasure, for the present as aforesaid, to reserve under our Sovereignty, Protection, and Dominion, for the use of the said Indians, all the Lands and Territories not included within the Limits of Our said Three new Governments, or within the Limits of the Territory granted to the Hudson’s Bay Company, as also all the Lands and Territories lying to the Westward of the Sources of the Rivers which fall into the Sea from the West and North West as aforesaid. And We do hereby strictly forbid, on Pain of our Displeasure, all our loving Subjects from making any Purchases or Settlements whatever, or taking Possession of any of the Lands above reserved, without our especial leave and Licence for that Purpose first obtained. And We do further strictly enjoin and require all Persons whatever who have either wilfully or inadvertently seated themselves upon any Lands within the Countries above described. or upon any other Lands which, not having been ceded to or purchased by Us, are still reserved to the said Indians as aforesaid, forthwith to remove themselves from such Settlements. And we do hereby authorize, enjoin, and require the Governors and Commanders in Chief of all our Colonies respectively, as well those under Our immediate Government as those under the Government and Direction of Proprietaries, to grant such Licences without Fee or Reward, taking especial Care to insert therein a Condition, that such Licence shall be void, and the Security forfeited in case the Person to whom the same is granted shall refuse or neglect to observe such Regulations as We shall think proper to prescribe as aforesaid. And we do further expressly conjoin and require all Officers whatever, as well Military as those Employed in the Management and Direction of Indian Affairs, within the Territories reserved as aforesaid for the use of the said Indians, to seize and apprehend all Persons whatever, who standing charged with Treason, Misprisions of Treason, Murders, or other Felonies or Misdemeanors, shall fly from Justice and take Refuge in the said Territory, and to send them under a proper guard to the Colony where the Crime was committed, of which they stand accused, in order to take their Trial for the same. Given at our Court at St. James’s the 7th Day of October 1763, in the Third Year of our Reign.